QANTAS will slash 5,000 jobs, the size of its fleet, and flights - and axe its Perth-Singapore route - as part of a A$2 billion (S$2.27 billion) cost-cutting drive, chief executive Alan Joyce said. The announcement yesterday was met with more bad news, with Prime Minister Tony Abbott indicating he was reluctant to throw Qantas a lifeline. The massive cuts follow a half-year underlying loss before tax of A$252 million as the carrier struggled to combat high fuel costs, a strong Australian dollar and a gruelling battle with domestic rival Virgin Australia. "We are now enduring some of the toughest conditions we've ever faced," Mr Joyce told a press conference where he revealed plans for the biggest overhaul since Qantas was privatised almost 20 years ago. "Our response will be unprecedented in scope and depth." Qantas will axe 5,000 jobs, or about 15 per cent of its 33,000- strong workforce, by mid-2017. Pay for all staff will be frozen, said Mr Joyce, who will take a 36 per cent pay cut. The carrier will sell or defer the purchases of 50 aircraft, including delaying delivery of eight new Airbus 380s, and retire six Boeing 747s earlier than scheduled. In a move that will affect Singapore travellers, daily flights between Perth and Singapore will end in May, while flights from Sydney and Brisbane to Singapore will be downgraded from B-747s to smaller A-330s by September. "Perth-Singapore has been under-performing for quite some time," an airline spokesman said. 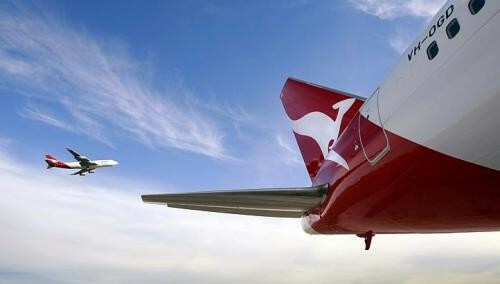 Industry experts in Singapore said the axing of Qantas' Singapore-Perth service is unlikely to lead to major fare rises. This is because there will still be about 10 flights a day serving the route, from Singapore Airlines as well as budget carriers Scoot, Tigerair and Jetstar. SIA flies to Perth four times a day, while Qantas flies just once. Ms Alicia Seah, spokesman for travel firm Dynasty Travel, said: "There will remain ample capacity in the market, and the competition is keen, so we don't expect the pullout by Qantas to have a major impact on fares." Qantas will also suspend growth plans for low-cost Jetstar Asia, which is 51 per cent owned by Singapore company Westbrook Investments and 49 per cent Qantas-owned. The Singapore-based airline has 19 aircraft serving 22 destinations from Singapore. Its chief executive Barathan Pasupathi said Singapore's operating environment was "extremely challenging", due to fuel costs, intense competition and an oversupply of capacity. "Until conditions improve, it is prudent that we suspend growth and focus on our existing network and business partnerships," he said. Qantas' international wing reported losses of A$262 million, up from A$91 million a year ago. The domestic division reported A$57 million in profit, a nearly 75 per cent plunge from last year. Seeking to explain the poor performance, Mr Joyce lashed out at domestic rival Virgin Australia. He has repeatedly accused the airline, whose shareholders include Etihad Airways, Singapore Airlines and Air New Zealand, of adding seats and enduring heavy losses to try to weaken Qantas. "The Australian domestic market has been distorted by current Australian aviation policy, which allows Virgin Australia to be majority-owned by three foreign government-backed airlines and yet retain access to Australian bilateral flying rights," he said. "Late last year, these three foreign-airline shareholders invested more than A$300 million in Virgin Australia... That capital injection has supported continued domestic capacity growth by Virgin Australia despite its growing losses." But analysts had little sympathy, noting Qantas still has a 65 per cent share of the domestic market but has struggled globally. Qantas shares closed 9 per cent lower at A$1.15 yesterday. "Qantas is shrinking as a business and its international success into Asia is still many years away, if ever," Invast analyst Peter Esho said in a note on the results. Mr Joyce has been hoping to secure a debt guarantee or a change in legislation to allow Qantas to become foreign-owned. Mr Abbott poured cold water on a debt guarantee. "Why should the government do for one what it is not prepared to do for all?" he said in Parliament yesterday.